On THE DEVICE  (LE DISPOSITIF)—"An interview with Thomas Bertay and Pacôme Thiellement at the screening of seven experimental videos comprised within LE DISPOSITIF collection on March the 21st at The Nadir. Directed by: Philippe Zunino. Co-Production: Bandits-Mages and Upper Camera"— Presentation. A French source from Isabel Carlier at Bandits-Mages (2013)—translated into English by Michel Belisle at criticalsecret (2014). 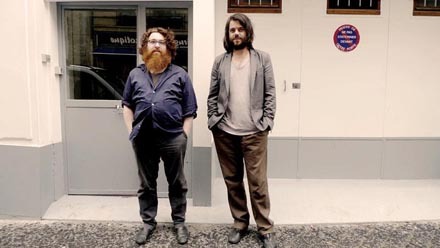 PACOME THIELLEMENT & THOMAS BERTAY from Bandits-Mages on Vimeo. DISPOSITIF 47 "The Second Death" Screenshot. 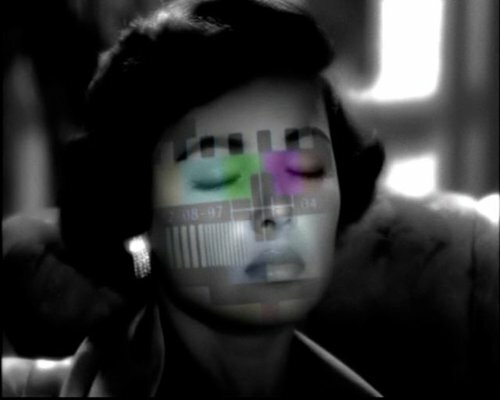 LE DISPOSITIF is a collection of 52 videos of varying length. It is an orientation, explanation and conditioning program. Fragmentation, being a paradoxical consequence of globalization, is an internal human process that spreads throughout modern times. This phenomenon is commonly compared by specialists in India to the era of the goddess Kali (Kali Yuga). They can see there a form of self-cannibalism that manifests itself most commonly as a representation of oneself being a collection of separate parts, each seen as a fetish. The symptoms are numerous: pandemic development of multiple personalities, tabula rasa (blank slate levelling) psychological projects by Dr. Cameron, chaotic and simultaneous appearance of serial killers and fast food chains, or metastatic ubiquity of stars who do not know very well where they stand when the most famous among them are asking themselves the question (in posters, TVs, human brains or hard drives?). In today’s world, one only appears in parts. LE DISPOSITIF produces an electrical current that aims at rearranging the pieces and generate mental bifurcation areas. A "Restored Man" project has repeatedly been evoked in history: it would be the effect of the bicameral divine voice—represented in turn by the face of the Fox, the Butterfly, and the Seahorse—revealing itself as Birdmen, distant root representatives of humanity with its unclear origin (Mazdean Fravashi, Angels, Aliens?). Assuming that all information is pollution, the viewer is offered a variety of perspectives operated by LE DISPOSITIF which strengthen its immune system to confront the waves of chaos and dislocation to come. LE DISPOSITIF, is created by Thomas Bertay & Pacôme Thiellement and produced by Sycomore Films: http://vimeo.com/sycomorefilms. Pacôme Thiellement was born in 1975 in Paris. He has written numerous essays combining pop culture and gnosis, from "Poppermost", on the death of Paul McCartney (MF, 2002), to “Tous les chevaliers sauvages" (All wild knights), around the Hara-Kiri team (Philippe Rey, 2012 ), through “La main gauche de David Lynch” (The Left Hand of David Lynch) (PUF, 2010) and “Les mêmes yeux que Lost" (The Same eyes as Lost) (Léo Scheer, 2011), and a novel, "Soap Apocryphe" (Inculte, 2012). He co-directed the video collection LE DISPOSITIF with Thomas Bertay between 1999 and 2013. From March to December 2013, he is in residence at the Monte-en-l’air, and under the name "Satan Trismegistus" schedules lectures and readings around the great figures of modern demonology. He is coauthor, with Thomas Bertay, of the video collection LE DISPOSITIF (AVIFF 2011 award in Cannes). Thomas Bertay, founder and leader of the production company Sycomore Films, a company he established in 1999, where he has produced since, and in complete independence, about forty films (fiction, documentaries, corporate productions, and video art). He co-produced and signed the editing of the latest movie by Nico Papatakis, Gloria Mundi, released in 2005. He has worked with these directors and artists: Jean-Jacques Beineix, Mickael Raeburn, François Lunel, Manuel Pradal, Valérie Pavia, ZEVS, Anne Jaffrenou, Marie Cuisset, Adrian Smith, Aude Py, Wolfgang Natlacen, and Frédéric Nicolas. He is coauthor with Pacôme Thiellement of the experimental video collection LE DISPOSITIF (1999/2013) shown in numerous projection rooms (Centre Pompidou, Gaîté Lyrique, Forum des Images, Espace Ricard, Denfert-Rochereau) and subject of two partial retrospectives, one at the Palais de Tokyo, and the other at l’Espace Niemeyer (PCF). Only French. Festival “Côté Court 2013″ : Eros et Thanatos (§ "Le Dieu-peur"). French-English. The end of Satan, The notebooks of January from Pacôme Thiellement especially "Epilog such as links" with a visual bibliography (first covers of his books) @ www.criticalsecret.net. Pacôme Thiellement and Thomas Bertay (second left and right)—Le Dispositif (The Device): "Morceaux d’homme" ("Pieces of Human"), 60’: Award winner "Aviff Cannes 2011". http://art-film-festival.com/aviff/. Translated into English as “The Device”, Ed.